Depart from Madrid in a comfortable, air-conditioned coach, and relax during the scenic drive to Toledo, a cultural melting pot renowned for its harmonious combination of three cultures. Commence your guided tour in the old quarter and note the Arabic, Renaissance, and Gothic architecture as you navigate the ancient labyrinth and learn about Toledo’s intriguing history. Gaze at the medieval castle, with its towering turrets reminiscent of fairy tales, and admire the ancient majesty of Santa Maria La Blanca Synagogue, the oldest synagogue in Europe. Then, feast your eyes on some of El Greco’s most influential artworks in the Church of St Tome. Gaze at the meticulous brushstrokes in The Burial of the Count of Orgaz, and then head to the Monastery of Saint John of the Kings for a tour. Stroll amid the courtyard cloisters and royal coats of arms in the religious structure and then head to the house of local sculptor Victorio Macho to see the eponymous museum dedicated to his impressive sculptures. Choose the full-day tour to enhance your experience of Toledo. 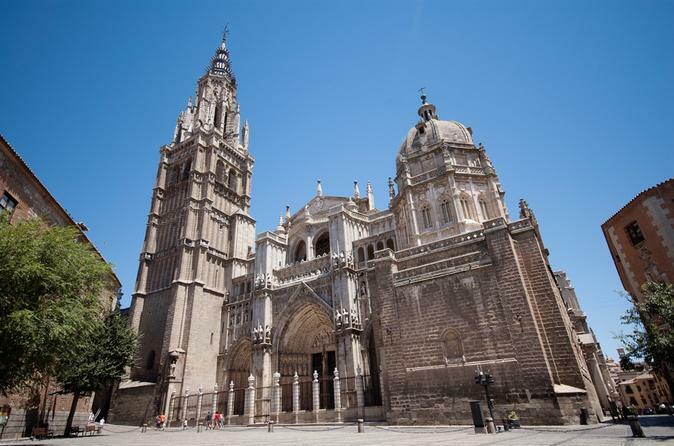 See the UNESCO World Heritage-listed Cathedral of Toledo, a 13th-century structure declared Spain’s finest example of Gothic architecture, and take a guided tour of the interior. Enjoy a panoramic tour of all of the city’s significant sights, and opt to enjoy a traditional lunch of Spanish specialties. Please see the Itinerary section for a sample menu. If you opt for the Toledo and Madrid combo tour, you'll begin the morning with a half-day tour of Madrid, stopping at highlights such as the Royal Palace, the Prado Museum, Ventas Bullring, or Santiago Bernabéu Stadium, with a complimentary drink at the Hard Rock Café. Continue afterward with a half-day tour of Toledo, including entry to the Church of St. Tome, Monastery of San Juan de los Reyes, the Synagogue of Santa Maria la Blanca, and the Mosque of El Cristo de la Luz.